It's Raining Jobs -- In California? In January, only 700 jobs were created in the entire state of California. But in February, believe it or not, reports show that a whopping 100,000 new jobs were created, according to the California Employment Development Department. What's responsible for the state's latest employment gold rush? Growth in high tech is a major factor. The northern part of the state can't find enough qualified coders, computer engineers and the like to adequately feed its need. Internet giants such as Google and Facebook have announced that they'll hire more in 2011 than in any year prior. High tech positions account for the 40,000 new jobs that were added in February in the professional services sectors, which also includes manager and accountant positions. Then there's the information sector, which includes California's famous movie and television industries. They added 15,500 new jobs. Trade and transportation added 9,100 new jobs, and leisure and hospitality, also big in California, added 5,900. The biggest surprise of all was that construction, which took a huge hit during the real estate bust, added 15,500 new jobs last month. Public sector jobs made up the only category that took a hit, but this comes as no surprise as the entire state, as well as major cities, slashed budgets, salaries and positions in February. But unless you're a computer engineer, don't pack your bags and head out west just yet. California lost about 1.2 million jobs since January, 2007. And while the unemployment rate dropped two-tenths of a percent in February, it's still at 12.2 percent, which is substantially higher than the 8.9 percent national average. 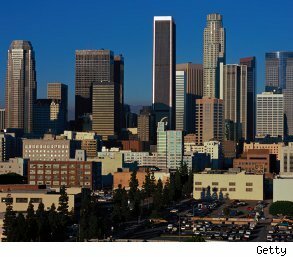 And it's even worse in some counties -- the Riverside San Bernardino areas have a 13.9 percent unemployment rate, and in Los Angeles County the rate is 12.6 percent. Still, those numbers are down from where they were in January, so while the California economy still has a way to go, it's getting better little by little.